My post regarding a shift in Hubbert’s peak stirred the pot a little and brought up a lot of questions that I think are worth answering. It also allowed me to identify knowledge gaps in people who seem to know their stuff regarding energy. This post is broken into sections. Step 1 Define continuous resources. Step 2 Explain what the technological changes mean. Step 3 Try to relate the energy return on investment to other energy sources. I found that most people who understand energy think they understand the energy return on fracking and oil sands, but their knowledge is about 3 years out of date. For some reason, their page does not appear to include light oil that occurs as continuous resources. However, if you search for formations like the Bakken and Niobrara, you will see them defined as continuous resources, and both have been evaluated by the USGS as such. I think the lack of defining a section for light oil has seriously misled people regarding EROI on shale oil because they think is all mined or at the very least bitumen. This is not the case in what is actively being developed today. How are continuous resources different from traditional drilling? If you would like to see other examples of traditional traps check out these links. All the systems above rely on buoyancy to move oil and gas into a favorable location for drilling. 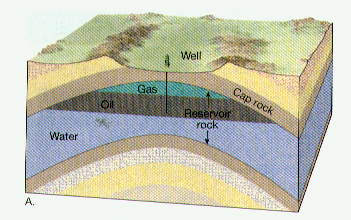 Over millions of years oil and gas being lighter than water move upward and are trapped under a cap of rock that the hydrocarbons cannot ready flow through. Ideally, the oil moves into a sandstone or a very permeable carbonate which makes the oil easy to get out of the ground, and if you are really lucky the field will even be overpressure so the oil will push its self out of the ground and you will not even need to pump it. (The Ghawar Super Field is probably the best example of an overpressure field) The downfall of a trap is that it traps just about everything that is buoyant so oil in a traditional trap is more likely to be contaminated by fluids or gases that drillers do not what to deal with. Acid gas (H2S) is probably the examples. Continuous resources are less likely to contain hazards impurities. Why is the oil or gas there? Although not always the case, most continuous resources that are currently being developed are nearly impermeable to fluid flow of any kind. The oil or gas that is in place is bound to the rock and will not move under normal conditions. Summary: Spelling out what you should take away from the information above. Continuous resources are often the source rock for traditional oil fields, and they do not depend on geologic structure. Changes in technology how to make continuous resources economic for development. Advantages and disadvantages of continuous resources.